San Jose State has been honored as an “Education Futurist” by Campus Technology magazine. Executive Editor Andrew Barbour observes “many of the most innovative solutions emerge in spite of — or because of — a lack of funds. A case in point is San Jose State University. “Faced with drastic cutbacks, backlogged course enrollment and soaring tuition among California schools, SJSU is experimenting with massive open online courses as a way to change the calculus. 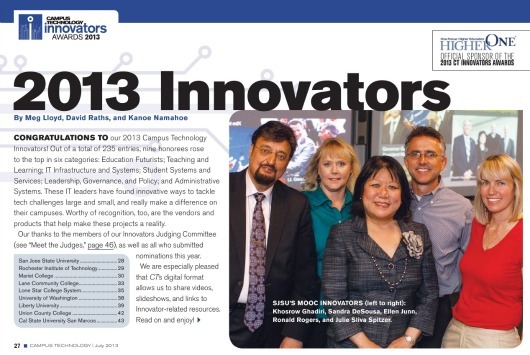 An 18-member panel selected just nine institutions including SJSU from a pool of more than 400 entries vying for 2013 Campus Technology Innovators Awards.